We stop perving over Faith long enough to bring you this verdict of her game. On the standard difficulty setting at least, a far more useful aid exists in the form of "runner vision", which marks parts of the environment Faith can climb, jump off or grab onto an eye-catching Soviet red. 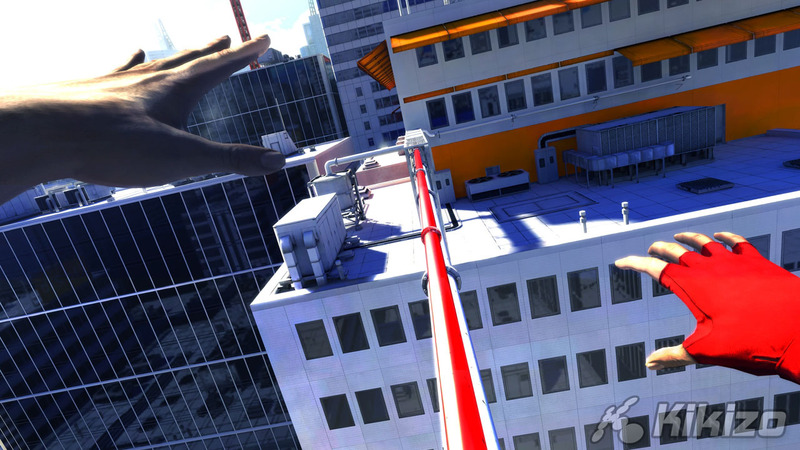 Just because you can see it doesn't always mean you can reach it, of course: as we've already suggested, Mirrors Edge demands millimetre-perfect judgement of distance, and you'll tumble to many a bone-squelching death before you sharpen up your act. Once said act has been sharpened, however, the many beauties of the level design sidle into view. While the idea is always to get from A to B, there are generally at least two ways of doing this, one more obvious and comparatively low-risk, the other more taxing but also swifter and - as a rule - a hell of a lot more impressive should you pull it off. With every second that passes another variation presents itself - letting go of a zipline a shade earlier, perhaps, or using a nearby crate as a makeshift boost board rather than scaling a ladder - each of which can impinge heavily on your finishing time. Replaying levels in Time Trial is consequently the key to the game's long-term appeal, as you squeeze the very last thimblefuls of juice out of the options available. 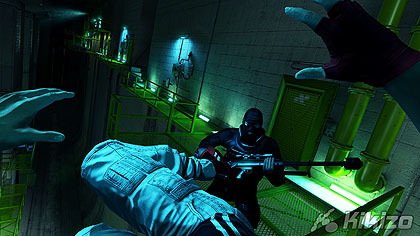 By seven or eight hours in (our completion time) you'll be chaining together jumps like there's no tomorrow, and even working the scripted enemy spawns into your game-plan, pinning a flying kick onto the end of a wall-run, or upper-cutting some hapless suit in the balls as you slide under a pipe. If you have trouble with a level, you can always scrutinise replays uploaded to EA's servers by top-scoring players. Take the stop-start sudden death formula in your stride, and there's little else to censure. The gunplay is heart-stoppingly generic, it's true, but this is no more than intentional: as a Runner you're the antithesis of everything static, shielded and well-armed, and firearms are thus to be treated as a definite last resort. You'll only get your hands on a gun if you take one from an opponent, and even then you're limited to the ammo in the clip. Faith is also much slower and less capable when so equipped. While it does a breathtaking line in shimmering city haze, saturated light and yawning draw distances, the engine does run aground on occasions. The odd loading pause slams down like a steel shutter as you transit between areas (others are cunningly veiled by elevator journeys), and however bright they appear from a distance, some textures grow fuzzy up close. None of these quibbles detract much from the splendour of the whole, though. Mirror's Edge has a fantastic relationship with colour, both as a device to waymark your route and, less literally, to denote moral or social standpoints (the fuzz are termed "the Blues"). This is definitely a game which will have passers-by clustering round the sofa. 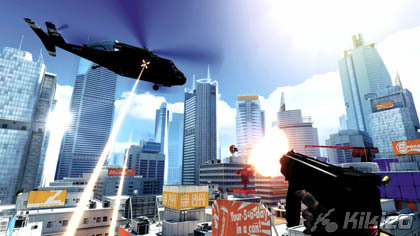 The soundtrack veers from a trancelike background hum to punchy percussion in concert with the action. That EA DICE has managed to pass off this fusion of arcade archetypes as anything like a relevant, ambitious title is hugely admirable, but will no doubt prove divisive. In spite of its bleached, postmodern brilliance and much like Sega's ambivalently-received The Club, Mirror's Edge is in many ways an anachronism, a punishing homage to arcade principles which will, we're afraid to say, probably deter as many players as it compels. Bow to its intimidating initial demands, however, and you'll discover a pearl of an action-adventure. If EA can continue wheeling out original IPs of this calibre, the future's bright indeed. THE VERDICT: Mirror's Edge commits a fair few of videogaming's original sins - trial-and-error level design, a perfectionist attitude to the simplest of platforming mechanics - but buried beneath them is an intensely rewarding experience. Not for the faint of heart, but still worthy of acclaim.